When I was in fourth grade, I had a panic attack during a timed multiplication test. My teacher pulled me out into the hallway while I sobbed (dramatically), and informed me that school, dance class, piano lessons, and softball practice were probably a few too many obligations for an 8 year old. She told me I either needed to quit something, or get a planner. For me, organization isn't a natural gift -- it's a survival method. I hate doing it, but I have to in order to ensure that my head doesn't fall off and roll around on ground, collecting bits of garbage in its hair. So, if I *must* sit down and plan my life, I want to at least enjoy the process. It's gotta have an element of artistry and fun, or else I'm out. I've found that the only organizational system that has managed to maintain my interest is Bullet Journaling. Click any image in this post to take a closer look. The Bullet, or Dot Journaling system is a completely DIY (and therefore, custom) journal setup that can really be whatever you need it to be. It's a method for containing the madness of your entire life within one tidy notebook. No more endless lists floating around in your purse and ultimately going missing. No need for separate planners, calendars, and diaries. This can basically fill all of those roles, depending on what you need and how you set it up. Generally, you start with a blank(ish) notebook. When I say "blank-ish," I mean that the journal could have lines, or a dotted grid system, but it shouldn't have anything printed inside that constrains how the journal can be used. So, no printed calendar, hourly time blocks, writing prompts, etc. You want a blank slate -- just lines or dots to help you keep everything neat and straight. 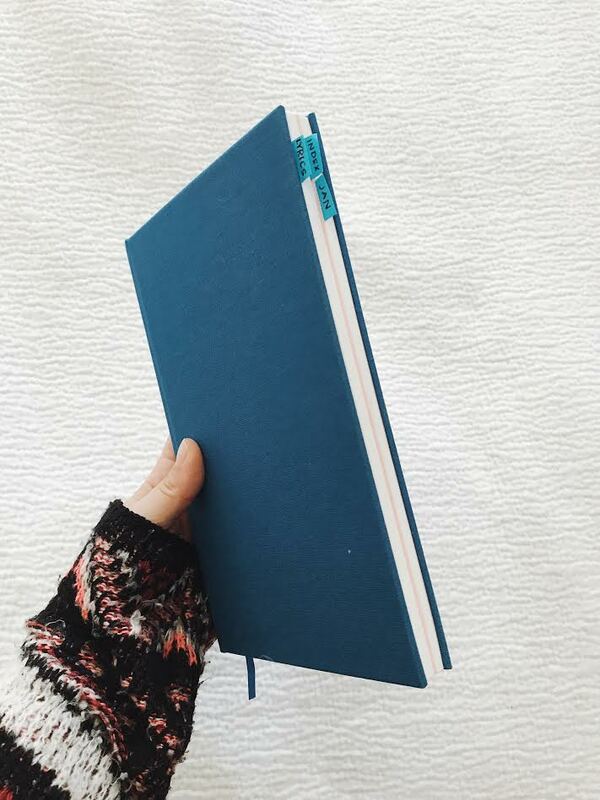 This book can basically be whatever you want it to be, but the most popular functions for a dot journal are a combination between a planner, a calendar, a diary, and a notebook for lists, ideas, etc. The idea is that you set it up in whatever way fits your needs best. If you're interested in an in-depth look at how bullet journals work, I highly recommend my friend Rachel Wilkerson Miller's book "Dot Journaling: A Practical Guide -- How to Start and Keep the Planner, To-Do List, and Diary That’ll Actually Help You Get Your Life Together." She also writes for Buzzfeed and has a great introductory blog post about how to set up your first Bullet Journal. Definitely check that out, and if you're hooked, grab a copy of her book. It's full of amazing ideas for layouts, lists, and systems that I never would have thought of on my own. 1. A notebook by Moo: I adore this notebook for so many reasons. It's hardcover and fabric wrapped, which I love. It just feels nice and sturdy. The pages lie flat, which is a godsend. They also come in several different color schemes, in "Classic" or "Bright" colors, which is great for future journals -- they'll look the same, but I'll be able to tell them apart with a quick glance. But there are two features that I love best. First, that the book is divided in half by pink pages in the center. This means that I can use the front half for my lyrics (which tend to be super messy and stream-of-consciousness) and the back half for my tidier planner/list/notebook section. I also love that it comes with a protective slip case. This keeps the pages from becoming bent when the book is floating around in my purse. But the added bonus is that I can slip my pen and markers inside the case, which makes my kit very travel-friendly. 2. A good, comfortable pen: I'm using the Pilot Precise V5 rollerball pen, for two reasons. One, I love roller ball pens and will never use anything else. And two, it was here. This pen writes really smoothly, but the ink does take a little longer to dry and can ever so slightly bleed through the page. But the writing experience is just so nice that I don't really care. 3. Two colored markers: Again, I'm using these markers because they were here. I don't even know the brand, but I like that the blue and pink coordinate with the book's color scheme. I use the pink marker to reference work-related things, and the blue for personal or home-related things. Rachel has some great recommendations and reviews for markers in her book. 4. A ruler: Gotta keep those lines straight, girls. Just like your stockings. 5. Washi tape: I don't use these too much, but I've found that I really like the addition of tabs on my journal. The indexing system in the front of the book is great for referencing back to my notes or lists, but I like putting one tab at the start of every new month, so it's easier for me to jump right where I need to be, or quickly reference last month's calendar. The beauty of the Dot Journaling system is that it's completely customizable. You can set it up in whichever way makes you feel like your life isn't spiraling out of control and straight into the shitter. So, whatever helps you achieve that, you do you. This is how I set mine up. That beautiful pink divider in the center of my Moo notebook gave me the perfect opportunity to separate my song lyrics from my day-to-day planner. In the past, I've found that I avoided writing songs in my bullet journal because my songwriting method is so quick and dirty. It was screwing up the lovely esthetics of my planner! Can't have that. This way, my lyrics are all at the front and easy to reference, and my planning section remains pristine at the back. Generally, the first step in creating a bullet journal is setting up your index and numbering your pages. At first, there won't be a lot to add here because you'll only have a handful of sections set up at first, but it's good to leave at least 3-4 pages for this index to grow as you add to your notebook. I have one short index in the front to catalog my songs, and one in the back to reference my lists and tasks each month. I've also got a key new my index which serves as a guide for my labeling system. Most bullet journals include a monthly calendar which provides a kind of broad overview of each month, and the events and tasks to be tackled during that timeframe. For me, this just seems a bit overkill. I found that I was never really referencing the monthly pages in my other journals, preferring to tackle things more on a weekly basis. Plus, I mostly use my digital calendar to keep track of my events, so the written monthly calendar just meant that I was adding things to two calendars. It was wasting time, and causing me to miss appointments if I forgot to add an event to both my digital and paper calendar. So, this time, I decided to just go a week at a time. Here's what I included on my weekly planning page. 1. A weekly task list: This is my to-do list, divided up into "work" and "home" categories. I add to this as the week goes on, and mark things done when I've completed them. If I need to, I use the arrow symbol from my key to migrate unfinished tasks to the following week. My daily planning pages are the ones that get the most use. Here's what I included on mine. 1. An hourly schedule: I've used a couple of pre-printed planners that have had hourly time-blocks built in, and found that I really like this method. I'm not always good at estimating how long certain tasks will take, so my hourly calendar is pretty fluid, but this practice helps me learn not to over-schedule myself. I hate getting through the day and only being able to cross a few things off my list because I underestimated how much time they'd take! 2. A daily task list: Here, I'll go back to my weekly overview page and pull from that task list. I try and take on only as many tasks as I think I can reasonably accomplish in one day. If I don't get to them, I migrate them to the next day. 3. Notes: This is my way of incorporating a short diary aspect into my day. Here, I'll write a quick blurb about what I learned, felt, or wondered that day. Personalized lists and the ability to take notes at any place within the planner are really what makes dot journaling so special. I have a couple of ongoing lists that I've already added to my journal, but if I ever feel the need to start a new one, like a weekly grocery list, a meal planning list, or a packing list, I can start one wherever I want and add it to the index. Here are some of the lists I've already added to my journal. 2. Notes on the latest book I finished: Any ENFP's in the house?!?! I just started and finished "Reading People" by Anne Bogel within 3 days (highly recommended, clearly) and had lots of things to write down when I was done. I'm a huge Myers-Briggs/Enneagram nerd, and being able to reference what I learned in the future will be a huge deal for me. 3. Greeting card ideas: The world is constantly providing me with fodder for greeting cards, so this is a handy place to jot down all those ideas as they come. 4. A daily gratitude list: Keeping track of the things that I'm grateful for on a daily basis does a whole lot of good for my happiness. Every evening, I flip back to this page and write a quick one-line reminder of what I was thankful for that day. 5. Shopping list: This is more of an overview of things I'm interested in purchasing in the future, and will be separate from a weekly grocery shopping list. It helps me decide where (or if) to spend any extra mad money earned during an especially good month. 6. Blog post ideas: Because I like to keep it fresh for you guys. There are just about a million ways that you can make a bullet journal your own, and I hope that this has given you a good jumping-off point! For more inspiration and layout ideas, don't forget to check out "Dot Journaling" by Rachel Wilkerson Miller, and let me know in the comments if there are any other resources that got you fired up to start your journal.